This movie was nothing short of awesome. Paul Walker's death loomed heavily over this movie for the fans who have been dedicated to the series since day one. I know a lot of people say that "if you've seen one, you've seen them all", and that's the furthest thing from the truth as can be. Since Fast & Furious came out in 2009, the last four films have been developing at a nice pace. After becoming a flagship franchise for street racers, it turned to The Rock to bring balance to it's cast and story line and they haven't looked back since. The story telling in this movie was superb, and the action scenes were awesome. I will say that it felt a bit cliché-ish at times, and the anticipation of what was going to happen was also embedded in the movie. I thought having the amount of actors on this scale was always a potential for things to get a little bit more crowded than need be, but the directors made sure that wasn't the case. Like I stated before, the only knock I had on this movie that at times it felt a bit cliché-ish and cheesy, but all in all, everything was nicely well done. I'm sure it's no secret about the ending of the movie because of Walker's death and while I was one who was hoping that he would go out in a blaze of glory, as one final last heroic act, like all great actors and heroes would like, the complete opposite happened. This movie franchise started on the backs of Vin & Paul and Paul literally carried it through a potentially series killing entry. Retiring him rather than killing him off was classy and tasteful move from the franchise runners and director. I'm joining the masses when I say that it was pretty moving looking back at all of the stills and actually breaking fourth wall and acknowledging his death in the final credits. Beyond the very emotional ending to this movie, Furious 7 lived up to be an awesome action movie with more development. One thing I would have liked to see was more fight from The Rock in this movie in terms of one on one scenes, but as I said before, the director did a great job of incorporating everyone into this movie and making it significant. There were actually a couple of surprises in this movie for me because I'm an avid movie and TV show watcher, so it was nice to see some of the actors in this movie. I didn't read any of the spoilers or casting so actually seeing the movie without knowing what's going to happen was a great thing. All in all, if you're looking for an action movie to go watch and just be entertained by, then this movie is for you. Don't think too much into as other people always want to make every single movie into a classic just because it's a movie. This movie served it's purpose as being pure action and just enough emotional scenes to keep it going. Oh yea, as for my favorite part, that has to be a tie between the two fight scenes with The Rock & Jason, and Jason and Vin. 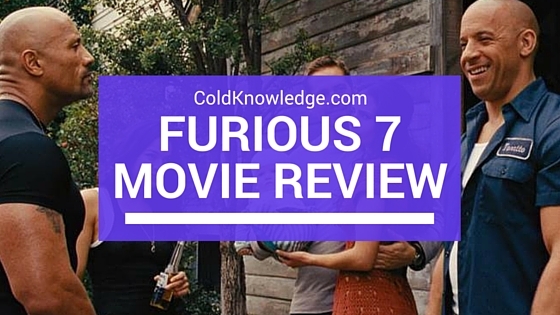 Did you go check out Furious 7? Did you like it, or did you think it was time for the franchise to hang it up? Leave it in the comments below. This movies was very good. I felt like this franchise has kind of left the thrill of racing cars and has turned into an action movie....which isn't a bad thing, because I am one of few women who actually like action movies. I did like how they retired Paul since he has a "family" now. I felt like they did him and his character justice. However, I do feel like they need to let the series go...I mean what's a Fast and Furious movie without Paul Walker? This is true, Paul made the series and held it up when they wanted to call it quits. I'm going to give Fast 8 the benefit of the doubt for now because I what The Rock brings to the series, he might be enough to keep it a float and a strong story line. I'm going to reserve my judgement for until after what they do with that entry.